A stroll at dusk along the waterfront paths of Brooklyn Bridge Park presents a look at New York City like no other — the fading skies over Liberty Island and New Jersey, the silhouettes of downtown Manhattan as the lights flicker on, the bridges of the East River awakening for another beautiful night. You can be forgiven for not liking every element of this 85 acre park along the western waterfront, from Brooklyn Heights to DUMBO. Some aspects are breathtaking, others a bit too phony. Construction began almost nine years ago and bits and peaces have slowly opened to the public. It’s ravishing but does not as of yet feel comfortable. The interruptions of the BQE, separating the park from Brooklyn Heights, may have something to do with that. See also: the luxury condos, the closed Squibb Park bridge, etc. But after reading A History of Brooklyn Bridge Park by Nancy Webster and David Shirley, I’ve gained a new appreciation for this varied and well-sculpted public space. The decades-long struggle to get it constructed is emblematic of modern New York, and the fact that succeeds for the most part is, in fact, a miracle. 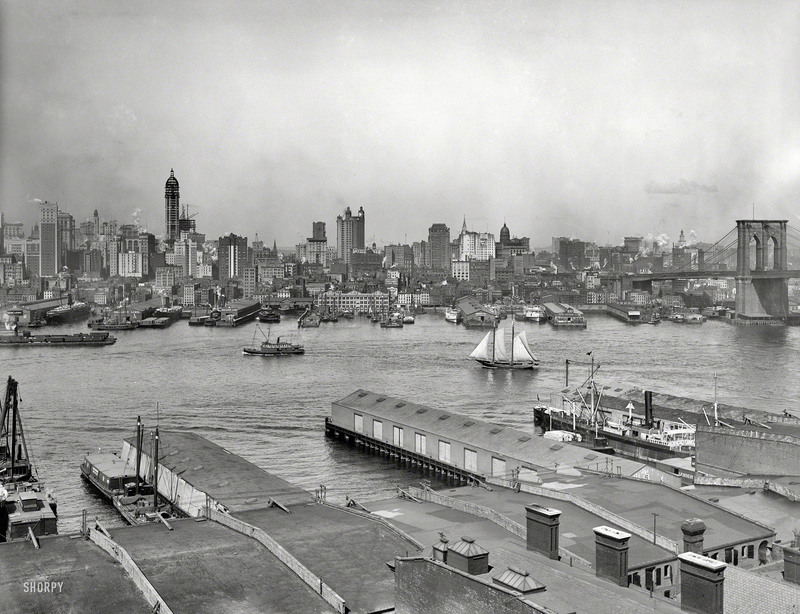 Below: The Brooklyn waterfront sometime in the 1900s. The waterfront has served two purposes — as a thriving port until the mid-20th century (when container shipping effectively destroyed Brooklyn’s pier industries), and as an unobtrusive platform for those that enjoy the gorgeous views of Manhattan from the vantages of the Brooklyn Promenade and the neighborhood of Brooklyn Heights. In 1965 the waterfront was designated a LH-1 (Limited Height) district, meaning that buildings couldn’t be constructed here that were higher than 50 feet. Of course, it didn’t specify the purpose of those buildings. For a moment in the 1980s, it seemed both of those original purposes would disappear as Port Authority considered selling the piers to private developers. An interesting struggle between the city and neighborhood activists exposed a litany of complicated issues. 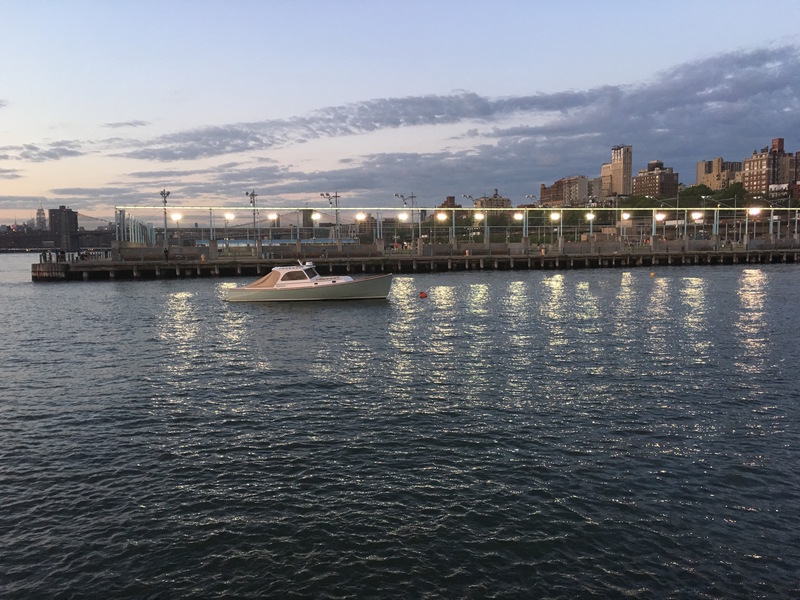 The community activists of Brooklyn Heights seemed to be working in support of the public’s interest in fighting to transform the waterfront into parkland. (The project’s original name was Harbor Park.) But weren’t they also preserving the values of their cliffside homes along the Promenade? Was this really in the best interest of all New Yorkers? Webster and Shirley take you through every contentious step of the park’s evolution from the 1980s until today. 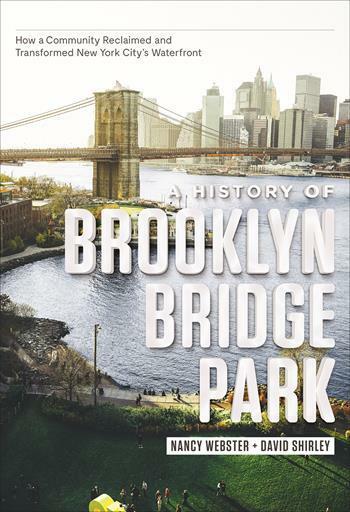 This book places the park alongside an interesting continuum of long-gestating New York projects, from the Second Avenue Subway to the One World Trade Center plaza. 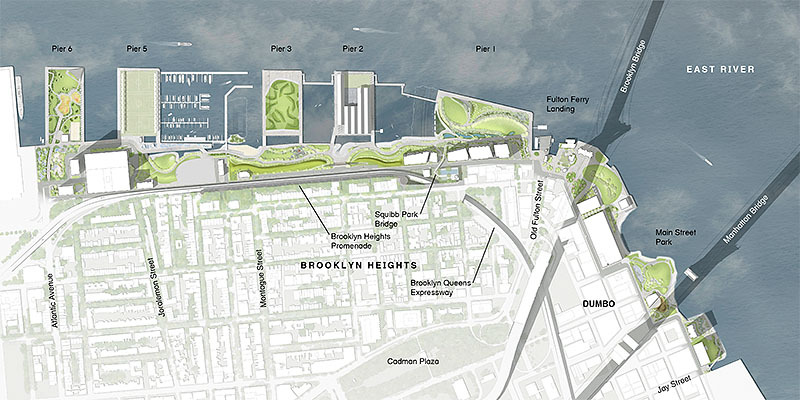 They also give a pointed impression of Brooklyn Bridge Park’s most unique quality — its location to the Heights which has protected it from routine development. In comparison, further north in Brooklyn, the waterfronts of Williamsburg and Greenpoint have been swallowed up with condominiums of massive height.